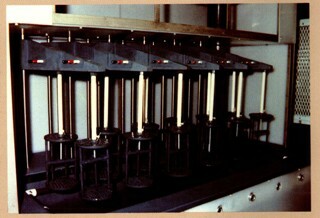 The images below show a testing station that built for a manufacturer of salt water activated batteries. Two test baths of salt water are used. One is maintained at 95 degrees F and the other at 35 degrees F.
Load arms are fitted with the test batteries and lowered into the bath. Digital temperature controllers precisely controlled the temperatures in both baths. Each time a test is completed, the baths are drained, rinsed, and refilled with de-ionized water and salt. The de-ionized water is cooled and stored in a separate section (not shown). The temperature is maintained by a chiller/heater unit. 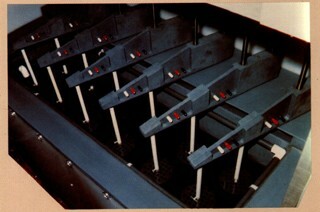 An electrical panel, in conjunction with a computer, controlled the operation of the system. The test tanks are made of PVC and set on stainless steel frames. All piping is done with PVC to control the corrosive effects of the salt water.